Between Bordeaux and the Spanish border is a unique and little-known viticultural landscape. South-West France is a wine lover’s paradise that cultivates an astonishing array of grape varieties, many that grow nowhere else, and produces a fascinating assortment of wines. 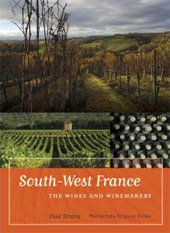 Paul Strang covers the South-West with deep expertise and enthusiasm, providing a history of its wine industry, including a near collapse and unlikely rebirth, and introducing readers to a region that seems to defy globalization. Intrepid readers are invited to rediscover this beautiful part of France, already well known for its cuisine, castles, and cave art, for its earthy and intriguing wines. The majority of this wine book is devoted to in-depth descriptions of about 30 appellations and the reviews of more than a thousand winemakers. Paul Strang shares his tasting notes together with the winemaking philosophy of each grower and indicates the price per bottle. The book also includes valuable maps and addresses, including phone numbers, emails and websites. Paul Strang must have spent ages on researching his wine book. Our visits to winemakers in this region confirm that he has actually visited them and tasted their wines. The great pictures taken by Jason Shenai deserve mention too. They bring this fascinating wine region as well as its winemakers to life.